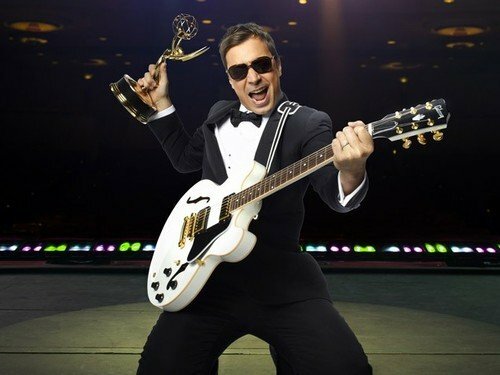 Can Jimmy Fallon Make the Emmys Relevant Again? Hosting the Emmys can be a thankless job. First, it’s no Oscars (which many believe is a similarly thankless job). Secondly, there always seems to be an outrageous expectation of an awards host: make us laugh! No, harder! It’s one of those jobs that, on paper, means you’re going places — but in reality, you start in the hole and have to dig your way out from underneath said expectations and deliver on top of that. Tonight’s Emmy telecast is aired by NBC and, as is the norm, they’ve put one of their own in the hosting spot. Late Night‘s Jimmy Fallon is to handle the proceedings, much as his predecessor Conan O’Brien, once in the same time slot, also handled the awards program. So what can we expect? The same stale one-liners about (insert hip or trashy show here), a cornball and silly opening song and the traditionally wooden teleprompter readings? Perhaps not. Fallon has safeguarded himself in a brilliant way for tonight’s festivities; if the jokes don’t fly, it’s your fault. You wrote them. One thing at which Fallon has excelled in his getting-stronger-all-the-time hosting of Late Night is a particular web savvy; he routinely works Facebook and iPhone apps into his top-of-show bits and has used Twitter often to involve his viewers in the show. Tonight he brings that ingenuity to the Emmy awards, offering to let viewers tweet jokes about presenters and reading some of the strongest entries aloud on the telecast. This could either, largely depending on your age, be a huge hit or a hugely terrible gimmick — but it’s bold of NBC to let Fallon lead this charge. After all, the host has nearly three million twitter followers and has been one of the few big names to successfully integrate twitter into the fabric of his celebrity; tweets from Fallon are almost always interactive, whether asking for creative responses from readers or linking to extra content not seen on Late Night. That said, working social networking into the Emmys could be a chance to lure a younger crowd back to a ceremony largely forgotten and passed over by TV viewers. Then again, it could also be said that one of the few viewing demographics left for the Emmys is an older crowd, which may not take to the web-based comedy easily and turn the channel. So the gamble then becomes: does NBC take the risk in order to bring younger viewers to the Emmys while facing the possibility of running off or disinteresting older viewers? NBC has taken a lot of heat lately, much of it tied to its pandering to older viewers — Leno was reinstated at Tonight largely because of faithful older demographic — but it’s not nearly as elder-centric as the neighboring CBS, which many believe tailors its programming to senior citizens (a recent report put the network’s average viewing age at 51). Perhaps a younger, hipper host like Fallon will work for the crowd who sits watching TV with their laptops open on the couch beside them. If anyone can pull it off and make the gimmick seem organic, it’s Jimmy Fallon — and it’s going to be an interesting experiment this evening. If this works, we may likely see more web-interactive live viewing in the future. The Emmys has not been appointment viewing for me in quite some time, but I’ll tune in tonight to see how it goes. After all, Fallon’s putting a lot of faith in his twitter followers…the least we can do is reciprocate that and put some faith in him, too.